Lygus bug (Lygus spp.) is a major strawberry pest in California affecting the yield and quality of berries. Although strawberry is not a preferred host for lygus bug compared to other hosts like alfalfa, as the strawberry crop is available almost throughout the year, it seems to serve as a permanent habitat for this pest. Flowering weed hosts like wild radish and wild mustard also harbor lygus bug populations. Regular monitoring to make treatment decisions, managing weeds or alternative hosts to limit the spread of lygus bug to strawberry fields, using flowering hosts as trap crops, conserving natural enemies, vacuuming, and chemical control are common techniques used for lygus bug management. Calculating degree-days is an approach that can help estimate when immature or adult stages of lygus bug will be seen in the fields so that appropriate treatment decision can be made. Degree-day is the unit of measurement for physiological time for insect maturity. In other words, it is the time an insect takes from one point to another point in its life cycle depending on the temperature. The amount of heat accumulated in 24 hours when the temperature is one degree above the lower developmental threshold is a degree-day (oD). The lower developmental threshold for lygus bug is 54 oF and it requires 252 oD (in Fahrenheit) for egg stage and 371 oD for nymphal stages to complete. Adults require 176 oD before they start laying eggs. So, it takes a total of 799 oD from egg to next generation egg. 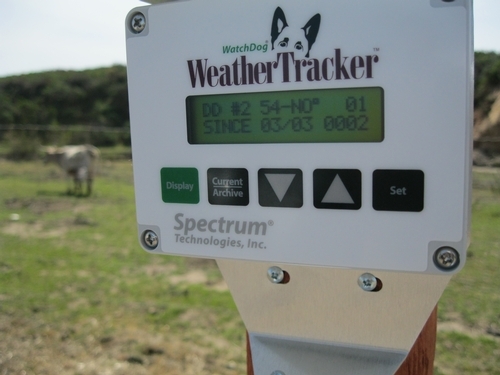 By monitoring the presence of lygus bug and daily temperatures, degree-days can be calculated to make treatment decisions against nymphal stages following UC IPM guidelines. 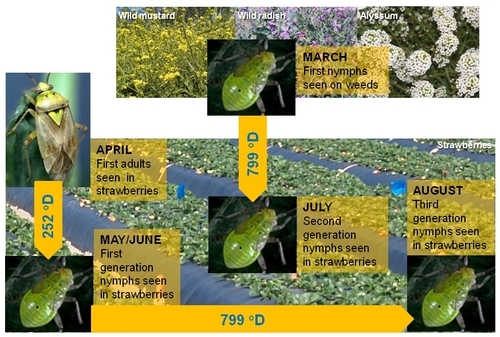 For example, if lygus nymphs are first seen in March on weed hosts or adults are first seen in strawberries in April, degree-day model predicts that first generation nymphs from adults can be seen in strawberries around May-June after accumulating 252 oD. Second generation nymphs, from the nymphs on weeds, can be seen in July in strawberries after accumulating 799 oD. The third generation nymphs from first generation can also be seen after 799 oD in August. 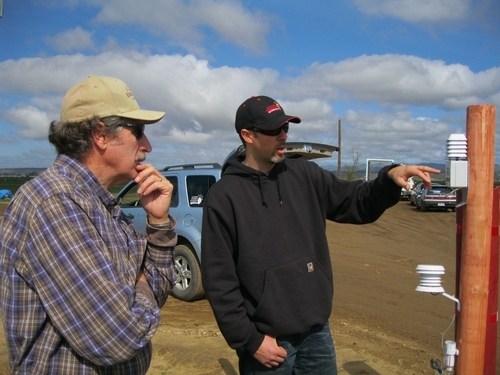 California Strawberry Commission, in collaboration with growers in the Watsonville and the Santa Maria areas, is working on monitoring lygus populations and calculating degree days. Data loggers that record temperatures and calculate degree-days were recently set up in about 35 strawberry fields in these two areas. Growers periodically monitor the fields and once the adult lygus bug is found, calculation will begin until 252 oD are accumulated. This indicates the time when the first generation nymphs emerge so that appropriate management decisions can be made. Although lygus bugs can move into the strawberry fields and deposit eggs several times during the growing season, resulting in the emergence of nymphs at different times, degree-day model can still help tackling the first generation nymphs. Visit UC IPM web resources to find out more information about degree-days (www.ipm.ucdavis.edu/PHENOLOGY/ma-lygus_bug.html) or to calculate degree-days by uploading your own temperature data (http://www.ipm.ucdavis.edu/WEATHER/ddretrieve.html).